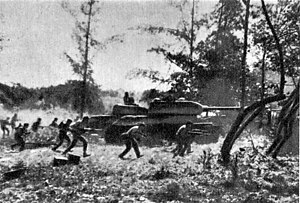 The Bay of Pigs Invasion was an attempt in 1961 (during the cold war) to remove Fidel Castro from power in Cuba. The CIA trained Cuban exiles and these exiles launched an attack in a bay called the Bay of Pigs. The invasion was a failure and most of the attackers were captured or killed. There were several conflicts that led to this; including a lack of promised air support and a change in where the landing was to be launched. This was one of many unsuccessful attempts by the CIA to rid Cuba of Castro. One interesting fact is that the plan was originally put in motion by Eisenhower, but the attack was ordered by John F. Kennedy who only found out about the plan after his election. ↑ Kellner 1989, pp. 69–70. "Historians give Guevara, who was director of instruction for Cuba's armed forces, a share of credit for the victory". ↑ Szulc (1986), p. 450. "The revolutionaries won because Castro's strategy was vastly superior to the Central Intelligence Agency's because the revolutionary morale was high and because Che Guevara as the head of the militia training program and Fernández as commander of the militia officers' school, had done so well in preparing 200,000 men and women for war." ↑ 4.0 4.1 FRUS X, documents 19, 24, 35, 245, 271. ↑ Quesada 2009, p. 46. ↑ "The Bay of Pigs". John F. Kennedy Presidential Library and Museum. Retrieved 23 April 2014. This page was last changed on 4 March 2019, at 16:19.